Google Scholar is a great source for every student or researcher to find some infos about the domain they are working for, you can find papers from thousands of libraries and you can download the for free. But not all of them like for example some papers from IEEE that will ask you to pay around 30€ in order to get access to the file you are looking for. Especially when you are looking for a part of paper that has 4 pages and asks you to pay 30€ is like paying 8€ per page. Of course downloading can be legal or illegal. I will try to explain both methods in this post. If you are a student from a university you will probably have free access to those papers. You have to go to your Settings option and go to Library tab. There you can search your Uni and save it as a library. When you will search for something and you will find a link for example from IEEE, there is an option to use your university credentials in order to log in. It’s on top of the page and writes Institutional Sign In. It will ask for your university credentials and when you first log in, by using cookies it won’t ask you again in case you open a new paper on IEEE. You can use your University credentials on almost every source given by Google scholar. Another legal way you could find the paper is by contacting the Author. Actually I tried it only once but not only he sent me the paper but answer to few of my questions. So this was more that just downloading the paper. Sci-Hub is a service/website created in 2011 by Alexandra Elbakyan and some people call it the New Napster. 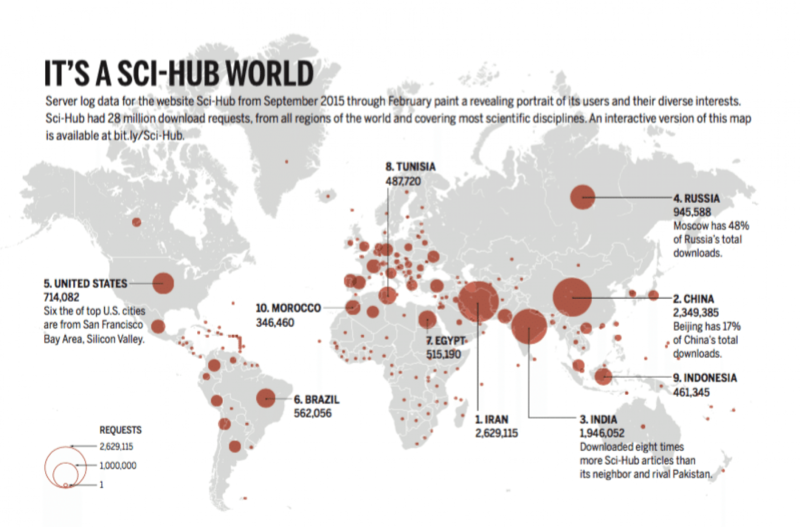 You can find more than 51 Million papers and everyday sci-hub serves more that 200.000 requests. Just by copying the URL of a paper and pasting into the text field of the following domains sci-hub.cc or sci-hub.bz or sci-hub.ac, you can download every paper FOR FREE. Below we can see some facts about sci-hub and how many requests it got from September 2015 until February of 2016. You can always use the IP of the website to access it 31.184.194.81 and in case you want to learn more you can visit wiki or just google it.